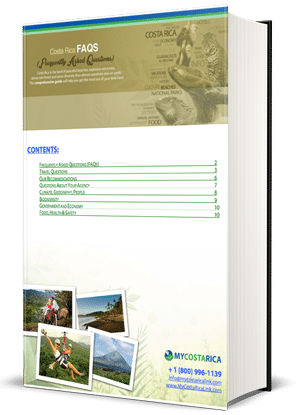 "Find all the answers you need in your free FAQ Travel Guide"
What’s inside the FAQ Travel Guide? Do you have any question about Costa Rica? Maybe what the weather is like? How much money should I bring? Or what the people are like? The Frequently asked questions document will answer all these and more. It gives the best advice on traveling and what to bring. Also, for even more information, you can ask us we will help with anything you need from the first ideas of your trip right down to the end we will be there. Come to us for Costa Rica Travel Advice. We live here and have more than likely experience the not so pretty parts of travel. So why not learn from the experts and let this be the best vacation possible. Travelling can be a hassle sometimes but it really shouldn’t be that is why we created the Frequently asked questions document. We want to give you the best Costa Rica Travel Advice. Costa Rica holds so much to behold. And there is nothing worse than running into a mishap on your adventure because of doing a little research. The good news is you don’t have to do tons of research. We have done that for you. Also, if you can think of a question that is, not in the FAQ document than we most likely have the answers. Your trip will already be a great on, let us make it the best. Our recommendations and Costa Rica Travel Advice comes from the experts. 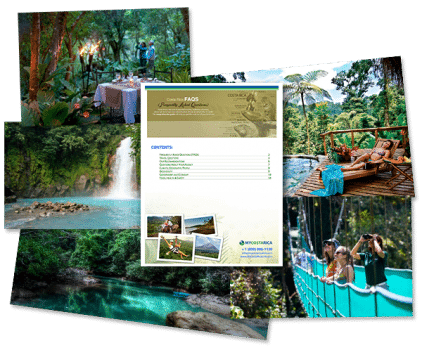 Over the years of living in Costa Rica, you get to know the best vacations spots, the most fun tours and the best ways to travel. We can recommend to you the most fun surf spot or the best Volcano views, the greatest beach front hotels, and so much more.